Is My Pallet Safe For Reuse? Around the world it’s estimated that around two billion pallets are used every day, and that’s not counting the ones lying around depots and factories awaiting reuse or recycling. 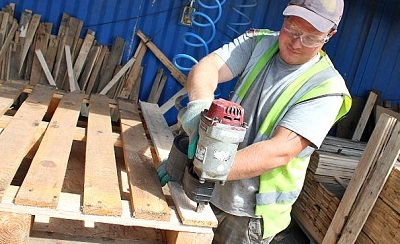 It’s not surprising then that pallets are the basis of many projects that make use of the material. But how do you know if the timber in a pallet is safe for reuse? Depending on where it’s from and how it’s been used, a pallet may have marks indicating how it’s been treated. Understanding these can help you determine whether a pallet can be used again. The first thing to check for if you’re planning to make use of a pallet in a creative project is that it’s clean. Pallets are used to transport all kinds of goods, and they’re subject to spillages, some of which may be quite nasty materials, so if there are stains or marks it’s best for pallet safety to avoid it. Check for the overall condition too. Pallets can have a hard life and may get damaged or broken. Check for splits and splinters and damage caused by nails and fastenings coming loose. Once you’ve found a clean pallet in good condition, the next thing is to check for markings. If a pallet is unmarked, it generally means that it’s a ‘national’ pallet used within a particular country. The wood in these is generally untreated but may still be safe to use. Pallets for international use have to be in accordance with the ISPM 15 regulations. These ISPM 15 pallets have to be treated either using heat or chemicals to ensure that they don’t harbour any pests, and they will carry a stamp mark to confirm that this has been carried out. There are a number of codes on these stamps that it’s important to understand. Most will carry an International Plant Protection Convention (IPPC) mark; this indicates that the pallet is made of wood that’s had an approved treatment. Further marks will indicate the type of treatment that’s been carried out. HT indicates heat treated pallets, MB shows that it’s been treated with methyl bromide, DB means the wood has been debarked, and KD means kiln-dried. Using heat treated pallets in your recycling projects is fine; they’ve undergone a process of heating in a kiln in order to eliminate any pests in the timber. Kiln-drying is similar but involves a longer, slower heating process aimed at reducing the moisture content of the wood and therefore making it less prone to warping and distortion. Debarking means that the rough outer layers of wood have been removed, although the pallet may be otherwise untreated. The one to worry about is methyl bromide treatment: this is a pesticide fumigation used to kill insects. It’s now banned in some countries and can be harmful to humans. MB-treated pallets should not therefore be used in DIY projects, and the wood shouldn’t be burned. MB-treated pallets should be taken to an approved waste disposal site for safe handling.